I’d stopped reading this one a long time back, but that was less about disliking the character or the creators and more about my usual general malaise. But this is the last issue — and Darwyn Cooke is doing the art. 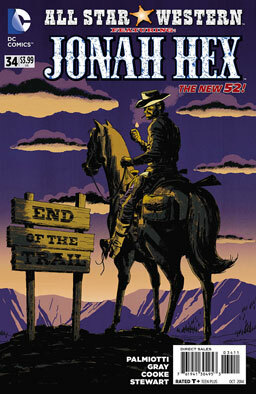 And I’ll always buy a comic that’s got Darwyn Cooke doing Jonah Hex art. There’s a lot of this that I missed out on, but at some point, Jonah Hex traveled to the present day, met some superheroes, and got plastic surgery to fix his face. But he’s back in the Old West where he belongs now, and he’s just met up with his fellow bounty hunter and sometime lover Tallulah Black. They’ve heard that there’s an outlaw impersonating him holed up in the next town over, and Jonah wants to see what this is all about. At the same time, traveling to the future meant that he also learned how he’d die, and he’s been dreading how it’s going to happen. Is there a future for Jonah Hex beyond getting murdered and sold to a taxidermist? Verdict: Thumbs up. A big chunk of the appeal is Darwyn Cooke’s art — but it’s also great to watch Justin Gray and Jimmy Palmiotti bid farewell to some characters they obviously care deeply about. I do love the fact that Jonah Hex is still very definitely Jonah Hex, even without his famous scars — and even more than that, I love the fact that Jonah’s all purty now, and he still loves the terribly scarred Tallulah. And most of all, I love the fact that we get a gloriously violent and crude Jonah Hex adventure mixed in with the perfect hope-for-the-future ending that you’d never expect Jonah Hex to actually get. And it all works perfectly. I’m gonna spoil the heck out of this comic, ’cause otherwise, I can’t tell you why I thought it was not good. Rebellious pop star Reese Greenwood and her bodyguard Theo have just watched Kenneth Laramy, jailed presidential candidate and unofficial leader of the pro-fascism movement, admit he’d just been along for the ride, desperate to get away from all the crazy nuts proclaiming him their new messiah — and then he got shot dead by his own supporters. Luckily, the feds tear in and save Reese and Theo. This leaves single liberal Sam Duggins as the only real candidate for the presidency. And then, after the election results are announced, and Sam is about to make his acceptance speech, Reese learns that Sam’s sister Julia was sleeping with and manipulating Laramy. And then Reese and Theo both learn that Sam and Julia are having an incestuous relationship. And then Sam gives an acceptance speech claiming that he agreed with Laramy and believes that it’s time the country abandons all pretense of morality to become a nation fully dedicated to evil. You know what you definitely wouldn’t get? You definitely wouldn’t get everyone in the country to just go “Oh, hey, the president wants us to be evil now, come on, everyone!” I could sorta believe it when Laramy was pushing the whole thing as letting angry people push back as hard as they want when people irritate or offend them. I mean, we’ve all seen what the NRA looks like nowadays, right? 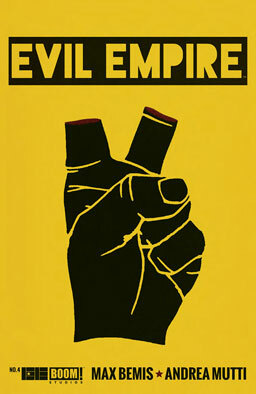 But you know who wakes up and decides to embrace cartoon-evil just because the president says so? Ain’t nobody. This series just faceplanted hard, and they are really going to have to work to make me keep reading.